This contentACCESS custom plugin is used for creating exactly one copy of tagged mails in public folders. The users are tagging mails Outlook with categories. 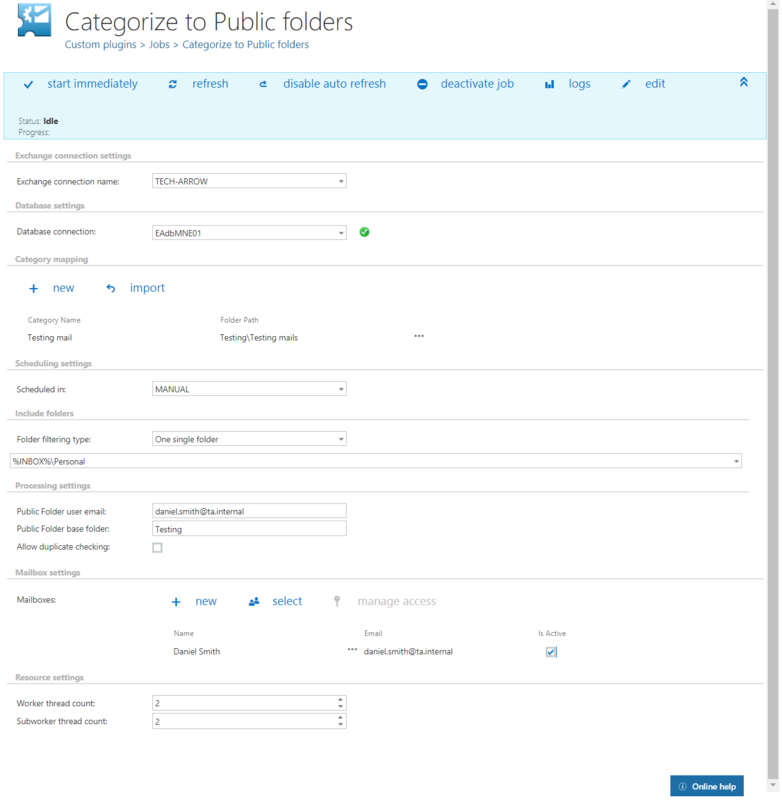 Each category is associated with exactly one public folder. The tagged mails are then copied to the respective public folder and are further processed. The folder name is used as the name for the Outlook category. 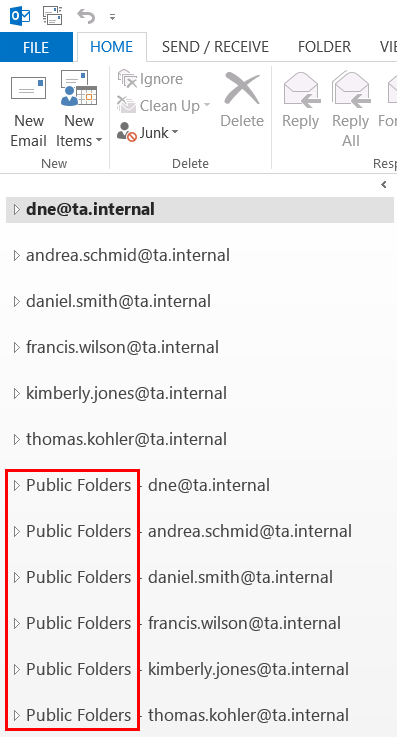 The public folders are organized in hierarchy, but the folder names are unique across the organization. This mapping must be maintained by the administrator: when new categories are created, the mapping must be updated. The changes in the mapping table are immediately reflected in the job(plugin). Go to Custom plugins -> Jobs, click +New and select Categorize to Public folders. First the connection with the Exchange server must be established. Before processing, the job builds a list of all mailboxes and mailbox groups found on the specified Exchange server. Only those queue items will be processed which mailbox is handled by the Exchange server. The process how an Exchange connection can be set is described in section Exchange connections of this guide. Further select this Exchange connection on the synchronizer job’s configuration page. Set a database where the job will write the necessary data. For more information how to create databases refer to section Databases. In this step the running time(s) of the job must be selected. It is possible either to select a scheduler from the list or to create a new scheduler via create new … option from the dropdown list. Using schedulers the administrator may automatize the running times of the given job. The mailboxes are periodically synchronized with the categories written into the queue in time intervals which is set here. For more information how to set schedulers refer to section Schedules above. 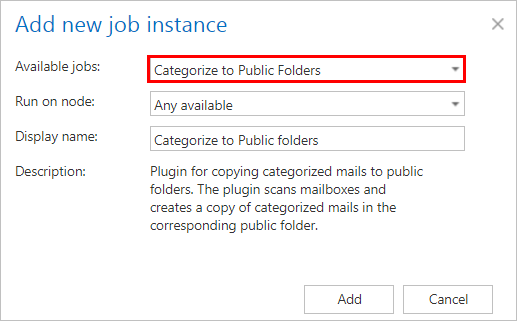 A category name to a public folder must be mapped. The full folder path must be entered here. When new categories are added, the administrator must update this mapping. The job is crawling the entire mailbox or recursive folder structures from the mailbox for further processing. Before you enter the folder name(s) to be crawled, it is necessary to select the folder filtering type. The email of the public folder user must be entered here. Mailboxes to be processed by the job must be selected here. Set the values, which will determine how many items will be processed simultaneously by the job. The recommended value is “2”. The mailboxes are crawled using EWS. Only minimal information is retrieved, which helps to speed up the process of deciding if the message needs to be processed or not. The processed messages are tracked in the contentACCESS database. The processed category is also tracked for each message. The modification date of the message is also stored, which helps to identify if the message was modified. Not modified messages can be skipped from processing. When is an email/message processed? The message is only processed if it has at least one category, which is in the category mapping. Private messages (messages with non-zero Sensitivity) are skipped from processing. The message categories are processed sequentially. For each category the mapping is searched. If there is no hit, the given category is ignored and no record is created. If there is a hit, the message is copied to the defined public folder. In this case the message ENTRYID is not found in the contentACCESS database and therefore is sent for processing. All categories of the message are processed. In this cases the messages/emails may not be processed again.